Fall is my favorite time of year - the cooler, crisper weather, the amazing colors of the turning leaves, pumpkins and apples, Halloween and Thanksgiving - what's not to love? Fall is also one of the things I miss the most about no longer living in New York. Sadly, it just doesn't exist in FL. Not that that little fact of South FL life has stopped me from immersing the Lil Divas in all things fall as soon as September rolls around. There are lots of amazing fall themed books for kids so I wanted to share of our tried and true favorites with you. Leaves by David Ezra Stein - A cute story about a young bear in his first autumn who is confused and worried by the falling leaves. We're Going on a Leaf Hunt by Steve Metzger - This is such a favorite with tots and preschoolers. My girls always wanted it read over and over again so they could join in with me. Be prepared to read this one many times this fall. Leaf Man by Lois Ehlert - This is one of our favorite books. The first time I read this book to the Lil Divas they immediately begged for their own copy which I had to purchase before I could return the library copy we had borrowed. This book inspired so many leaf creations of our own so be sure to go leaf collecting before you crack it open for the first time. Fletcher and the Falling Leaves by Julia Rawlinson - An adorable fox worried by the changing season tries to keep the leaves on his beloved tree to no avail. What I enjoy most about this besides the cute story are the illustrations. This one was a favorite of the Littlest Diva even when she could barely sit through an entire book because it always caught her eye. The Little Yellow Leaf by Carin Berger - Little yellow leaf isn't ready for fall, isn't ready for change. It holds on even as all the other leaves let go. Oh, how I adore this little story! Haven't we all been there - afraid of change, afraid of letting go. This is one that you will definitely enjoy reading to your kids. Every Autumn Comes the Bear by Jim Arnosky - follow a bear on his journey from autumn to winter and hibernation. Short sentences and lovely illustrations made this a great choice for my beginning reader. Acorns Everywhere! by Kevin Sherry - This is another kid chosen fall favorite. The squirrel is hilarious and the Lil Divas laugh at loud at his antics. Be prepared for lots of giggles with this one. The Busy Little Squirrel by Nancy Tafuri - Fall is a busy time for squirrels as they work to prep for winter. Squirrel has no time to play with his friends, he must collect nuts and berries and prepare his nest for winter. Let it Fall by Maryann Cocca-Leffler - Follow a family through a typical fall filled with falling leaves, harvests, pumpkin picking and more. A great peek into fall fun. Count Down to Fall by Fran Hawk - So much information about leaves and it's perfect for inspiring leaf hunts and nature walks in fall. We have several of these and they are on my desk for the coming weeks! Thanks for sharing your list! Thank you for stopping by! Do you have any faves not on our list? I'm always looking to add new ones to our library. 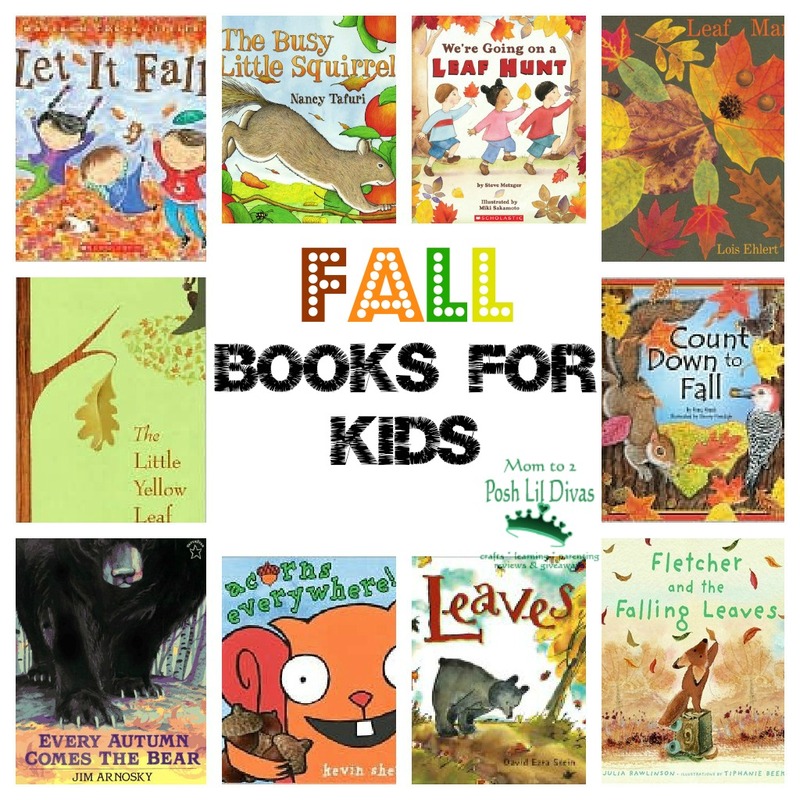 Great book choices for fall themes in preschool. I love Why Leaves Change Colors http://www.amazon.com/Leaves-Change-Lets-Read---Find-Out-Science/dp/0064451267/ref=sr_1_1?ie=UTF8&qid=1347361926&sr=8-1&keywords=leaves+change+colors Great book for explaining the real reason for the change in colors. Amazing. With October being Fire Safety month I like Matches Lighters Firecrackers are not Toys book http://www.amazon.com/Matches-Lighters-Firecrackers-Toys-Safety/dp/051641982X/ref=sr_1_1?s=books&ie=UTF8&qid=1347362060&sr=1-1&keywords=matches+lighters+and+firecrackers+are+not+toys It's an old book but still available on amazon. thanks for sharing your picks with me! These are some great titles! I think I'm still in denial that fall is here. We didn't get much of a summer so fall seems a little premature but I guess I better get over it. ;) Thanks for some good book ideas. Love Arnosky & Ehlert at our house, too! These look like fabulous choices for fall books. If you do turtles or reptiles I would like you to consider Tadeo Turtle which comes with a free curriculum. Guys, here is an information to learn how to use a colon in writing. Check it out!